Antiquing cabinets using stain or glaze is a good look for a country kitchen or for kitchens decorated in a Tuscan, French or Victorian style. The antiqued cabinets give the room a warm, homey feel. People will want to gather around the kitchen table. 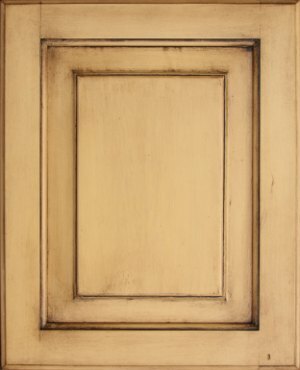 Using stain or glaze to produce an antique effect is done on painted cabinets. Additional effects can be added later to produce a more complete look. Such as distressing or strategic sanding. Regular wood wiping stain is used or a glaze mixed thinly, 50% paint – 50% glaze and a little water. Using the stain is easier overall but your colors are somewhat limited. With glaze the color palette is limitless. Before beginning you will need to do a little preparation. All cabinet hardware should be removed. Cabinets should be completely cleaned with a damp cloth. No chemicals should be used, to eliminate any possibility of chemical interaction with stain or glaze, resulting in a color change or loss of adhesion. Lightly sand all surfaces and wipe off any dust. If the cabinets are already painted there is no need to prime, the sanding should have produced a good surface for the new finish. Apply a good wood primer if your cabinets are already stained and finished. The primer can be tinted and act as the base coat but it will take two coats of primer. Allow the primer to dry overnight. For dark base colors you will need to apply paint first. Use a satin sheened oil base paint if using the wiping stain or use a satin latex paint if using the glaze. Allow the paint to dry overnight before continuing with the process. This technique is used most often on light colored cabinets. In addition to stain, you’ll need a sponge, 2 paint brushes, paper towels and some clean white rags. Natural sponge is preferred over synthetic, because natural tends to be more durable. Before beginning, decide how you want the final product to look. For example, thin lines throughout, broad dark areas, large areas with no stain? With a little imagination, you can pull off a work of art. Create a worn look around where the hardware goes by using very little stain. Place stain or glaze in a flat paint pan after making certain that it is well mixed. Several clean household rags, preferably cotton, can be used. The rags should not be too large so that they get over-drenched with stain or glaze. Applying the Wood Stain or Glaze with a Rag – Hold a rag in your hand prior to dipping in the stain, to make certain it’s comfortable and that you can control its full movement. Apply stain to a small section or one entire door at a time. Allow the stain to sit for a couple of minutes before wiping then wipe it off using a second clean rag or paper towels. The longer the stain is left on, the darker it may appear. Glaze is immediately wiped off after application. Test your color and technique somewhere on the inside of a cabinet, such as a door. Once you’ve become an expert in the process, move onto the outside of the cabinet. This is the part that the world will see. If cabinets are darker, the process will be the same except for the use of a light colored stain such as pickling white. In this case it may be necessary to completely paint over cabinets that are too dark. This would be a complete refinishing job consisting of sanding, painting, drying, and then later staining. Glaze allows more color choices and flexibility. The wood stain will need sealing or additional protection after it has dried. Apply a coat of clear wood finish to the entire cabinet surface. Two coats can be used with a light sanding in between the coats. If using glaze there is no additional sealing but it is a good idea. A water based clear finish can be used over water-based glaze/paint. Here is a video I found that does a good job showing how to antique a cabinet using glaze. The process is almost the same for using a wood stain. What color is used with the above sample, not in the video. I like the darker honey look. Thanks! Used wood stain over painted (latex) cabinets. 48 hours later cabinets are still tacky, is this normal? Wanting to use a polyurethane coating to seal, getting impatient to put bathroom back together. Yes, this is normal for oil based stain over latex paint. Dry times depends on many things, just wait for the stain to fully dry before applying the poly clear coat. What do you recommend using over satin paint? I painted my open kitchen cabinets with an ugly orangey gloss paint on top of other colors. Now after numerous coats of every color under the sun I want to “antique” the frames. What should I do? There are several ways to age over existing paint; crackling, glazing and distressing are typically used. Any combination on these techniques can be applied but combining distressing and glazing can provide good results. You will need to experiment to find the right combination. I have painted my cabinets with Valspar cabinet paint and used valspar antique glaze on them, how do I seal the glaze on them? Just apply a clear coat. Oil base Varnish or water based acrylic clear coats will work. Note; The water based clears a harder to apply by brush/roller but will add no additional color as the oil base varnish is easy to apply but will add an amber color.